A sawmill in the province says it has only enough hardwood supply to keep working for another week. Forty-five people work at the mill in Westville, Pictou County, owned by Groupe Savoie based in northern New Brunswick. Mill manager Andrew Watters says the same supply constraints that forced two flooring companies to close recently —​ Finewood Flooring of Cape Breton and River's Bend, Antigonish County — are also hurting its business. "We will be forced to look at shutting down," says Watters. "We could have enough to sustain a day, a week, or couple of days every couple of weeks, but that depends on our deliveries." Fewer people working in the woods has reduced the flow from private wood lots from 70 to 50 per cent. Westville procurement manager John Vautour says many contractors left to work out west as the number of sawmills have dropped by half over the past 10 years. Vautour said the Department of Natural Resources figures indicate the problem is not a shortage of hardwood trees in the province, although some stands in Cape Breton now produce fewer sawlogs. Markets for Canadian lumber, cabinets and pellets — all produced by Groupe Savoie in New Brusnwick — are strong again thanks to the drop in the Canadian dollar. 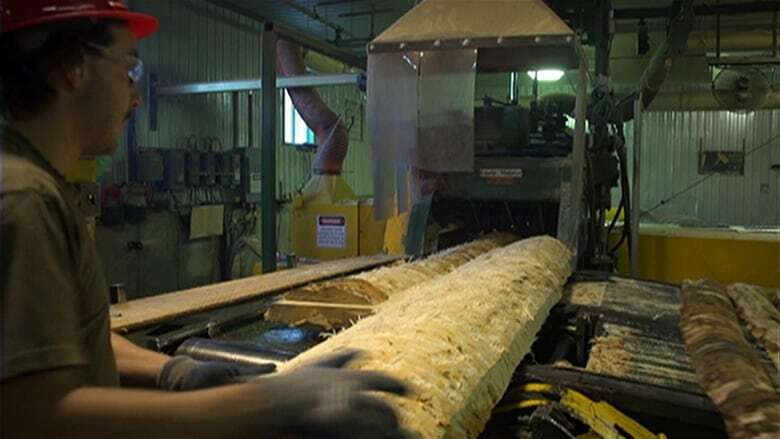 Vautour says instead of reducing production, the Pictou County mill could be employing 80 people, running two shifts a week, if it could obtain a steady supply of hardwood. All 175,000 tonnes of hardwood on Crown lands in seven counties of northern Nova Scotia is licensed and controlled by Port Hawkesbury Paper. That's a result of the 2012 Forestry Utilization Licensing agreement with the province that was part of a deal to save jobs at the former NewPage mill. Groupe Savoie is still actively trying to negotiate access to a long-term supply on Crown land but the paper company's business development manager Marc Dube says the sawmill has twice turned down its offers. "They told us they couldn't find a contractor to harvest and then they said they could harvest at a rate much higher than the rate the rest of the people who work with us in the forest harvest," said Dube. Savoie says it is prepared to hire a contractor if that's what it takes to get a deal. Dube says the paper company plans to harvest more hardwood this year and make more of it available for firewood. He says only eight per cent of what the company cuts qualifies as the high-grade logs the sawmills want. Dube says 24 per cent of the Crown hardwood is sold to Nova Scotia Power as biomass for the boiler that keeps power costs down for Port Hawkesbury Paper. Also, 30 per cent of the Crown hardwood managed by the paper company is sold to Northern Pulp for use making pulp. Under Port Hawkesbury Paper's license with the province, the company is supposed to allow other companies access to hardwood grown on Crown land. In the past two and half years, it has signed only two agreements with two sawmills — B.A. Fraser and M.R. MacDonald. Both companies are now working as contractors for Port Hawkesbury Paper with only one sawmill operating. Natural Resoruces Minister Zach Churchill has the authority, under the 2012 licensing agreement, to intervene and assign Crown land when there is a dispute. "We do reserve the right to use that," Churchill told CBC News, "but we only use that if we deem that one of the groups is not being reasonable in their commercial dealings. But we have not seen to date evidence to suggest there has been any unfairness on either side." Watters says unless Groupe Savoie can make a deal with Port Hawkesbury Paper or the province for a long-term supply of wood, he'll be forced to idle the mill yet again. It worked only 31 weeks last year. "We've got to get access and get things rolling," says Watters. "The wood is there. We've got to get some communication going and discuss the issues and come to an agreement."